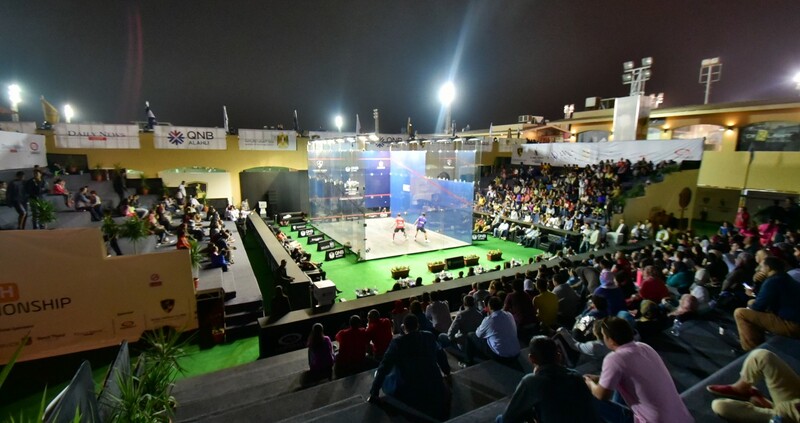 World No.1 Mohamed ElShorbagy and compatriot Karim Abdel Gawad will face off for a place in the final of the 2016 PSA Men’s World Championship – the sport’s biggest tournament – after they overcame World No.6 Ali Farag and three-time winner Nick Matthew on the opening day of quarter-final action in Cairo. 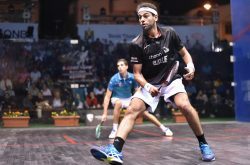 ElShorbagy kept his title charge intact after he avenged a semi-final defeat to Farag in front of the iconic Great Pyramid of Giza in September, coming through a feisty encounter to move to within one win of a third World Championship final appearance. 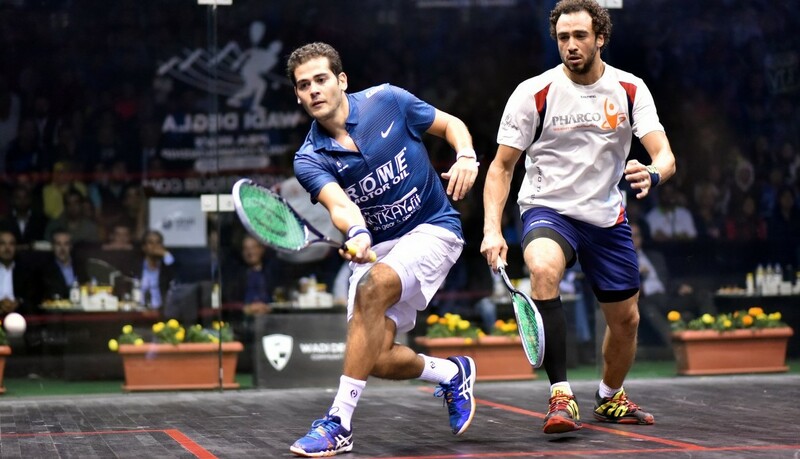 The tournament top seed – a runner-up to fellow Egyptian Ramy Ashour in 2012 and 2014 – took the match 11-8, 11-5, 11-8 in 45 minutes, but it wasn’t without its controversy as both players let their frustrations with each other boil over. “It’s a physical sport, things can get tough at times, you can’t help it,” said ElShorbagy. 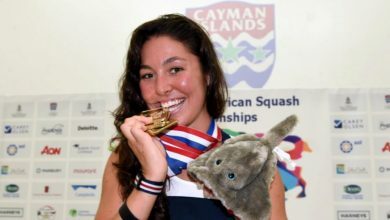 “You have to be tough to be at the top of the rankings. Nick Matthew and Greg Gaultier are great examples of that, as is Ramy [Ashour]. 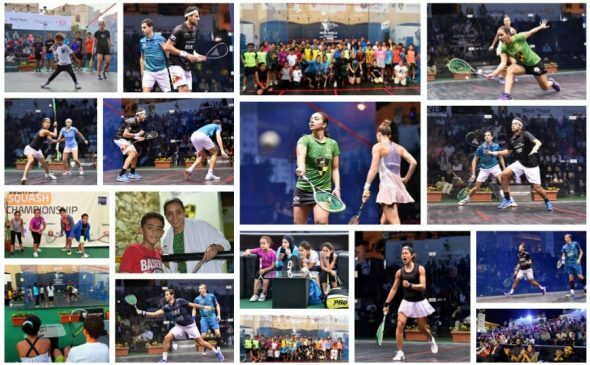 In-form World No.3 Gawad will appear in the semi-final stage of the illustrious tournament for the first time in his career after overcoming a struggling Matthew in the pair’s quarter-final clash. 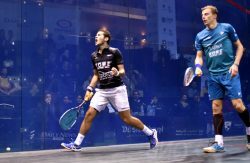 Gawad – who broke into the world’s top 3 in the November World Rankings – lost out to Matthew three weeks ago at the U.S. Open, with the duo serving up a superb match in Philadelphia. But Matthew was hampered with illness and, despite battling on, struggled to move freely, allowing Gawad to take a comfortable 11-9, 11-4, 11-9 victory in just 34 minutes to set up a mouthwatering semi-final clash with ElShorbagy. “I feel great, over the moon, especially because I had a very slow start to the tournament,” said Gawad. 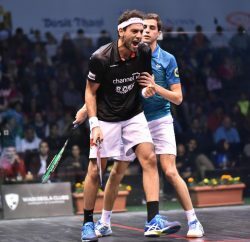 “I was nearly out from the first round but I talked to Amr Shabana and he told me to focus match by match. It’s just baby steps, I’m focusing on each match before moving on to the next one. It’s my first ever semi-finals in the World Championship. 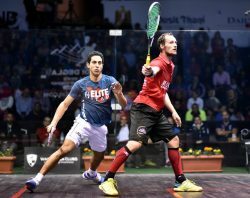 Three-time World Champion Ramy Ashour and defending champion Gregory Gaultier will lock horns for the 33rd time on the PSA World Tour after both players triumphed in their last eight clashes at the 2016 Wadi Degla PSA Men’s World Championship to set up a highly-anticipated semi-final clash in Cairo. 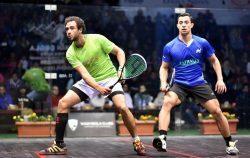 Ashour – who lifted the sport’s most illustrious title in 2008, 2012 and 2014 – dispatched fellow Egyptian Fares Dessouky in straight games to move to within one win of a fifth World Championship final. The maverick Egyptian stormed to a one-game lead, before coming out on top of an intense second game 17-15 margin to put one foot in the semi-final. Ashour started the third strongly, leading 7-1, but Dessouky fought back to level at 8-all. 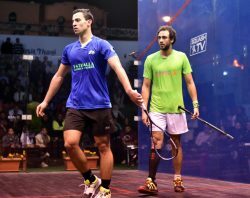 With a number of refereeing decisions going against an increasingly frustrated and annoyed Dessouky, at 10-8 to Ashour he reacted to another decision by conceding the match and walking off court to hand the win to Ashour. “That was very stressful, definitely,” said Ashour. “I was relaxed but I wasn’t there, I couldn’t find it. He was physical, I got into his physical game and things weren’t going my way in my short game. When things happen like that I find it a challenge. 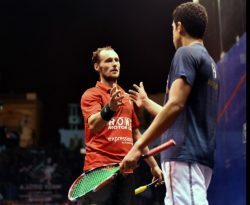 Meanwhile, Gaultier booked his place in a fourth consecutive World Championship semi-final after overcoming World No.11 Tarek Momen to become the only non-Egyptian semi-finalist. 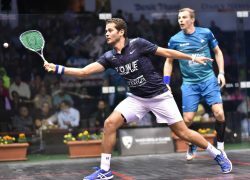 The charismatic ‘French General’ put in a masterclass of a performance in the opening two games as he mixed up the pace well and utilised all four corners of the court to power into a 2-0 lead, but he surrendered three match balls in game three after a litany of errors to give Momen a lifeline. 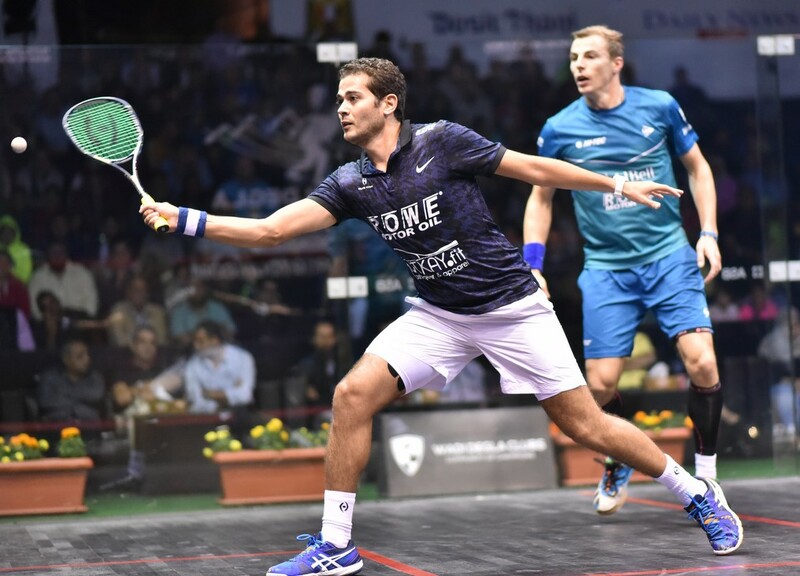 A series of high-quality rallies in the fourth lit up the Wadi Degla club as the match drew to a nail-biting finale, with Gaultier managing to reassert himself on proceedings to edge out an 11-5, 11-5, 14-16, 11-8 triumph to set up an explosive semi-final clash with Ashour, who currently leads the head-to-head record 25-7. 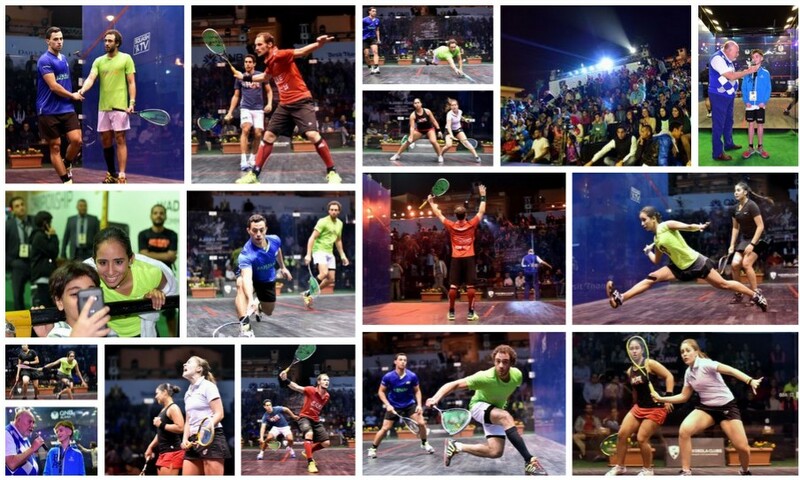 “He’s a really skilful player, he’s very dangerous, talented and he can put the ball away at any time,” said Gaultier. “If you don’t pay attention, you lose the big points, that’s what happened on the game balls. I didn’t play tight enough and I rushed myself. He’s talented and a hard worker.